"I've Got Dibs on Top"
Whether you're looking to create sleep space to accommodate overnight guests, or you're searching for the perfect bed for your son or daughter's bedroom, bunk beds are an excellent choice. In addition to proving kids with the perfect sleep space for a sleepover, bunk beds are also a great way to maximize on the vertical space in a room. 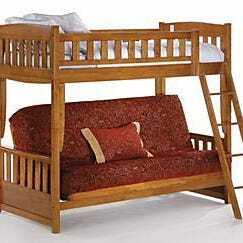 By stacking two beds on top of each other, you save valuable floor space for guests to relax and children to play. Bunk beds come in a range of styles, so whether you prefer the classic type with two twin mattresses, or a variation that features a full mattress on the bottom and a twin on top, you create whatever look you'd like to see in your guest room or kids bedroom. When you shop at US-Mattress, you have access to a wide inventory of bunk beds at the lowest prices on the web. In our collection of bunk beds made by the top manufacturers in the furniture industry, you'll find a variety of style, color, and construction choices. We carry a wide variety of iron bunk beds, steel bunk beds, wood bunk beds, futon bunk beds, and more. No matter what type of bunk bed is best for your home, you can find it at US-Mattress. 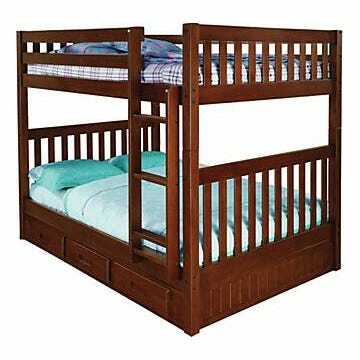 Also, we offer free shipping on all bunk beds, so you can save even more on our existing low prices. Find the perfect bunk beds for your home today!